All prices are for shipping within the continental U.S. Please contact me at if ordering from Alaska, Hawaii, or outside the U.S. as additional shipping charges may apply. Priority mail (2-3 business day shipping) is available for an extra charge. All other orders are shipped the first Friday following their purchase. 120 pages, including more than 90 cartoons as well as humor pieces and essays covering the weeks before the 2008 election through September of 2010. The dawn of Sarah Palin, Tea Parties and more. 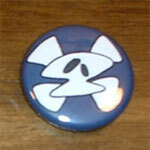 Also features an original introduction by Casper Kelly, writer for Adult Swim and co-creator of Stroker & Hoop. Signed copies: signed copies can be ordered via this site. Because of the extra transit time from the publisher to here, plus signing and re-shipping, please allow anywhere from 7 to 14 business days for delivery. 70 pages of cartoons, essays, and other humor pieces from September 2007 through September 2008. More info here! 150 pages, including over 100 cartoons, favorite essays and humor pieces from the website, and a foreword by Tom Tomorrow! Buy both You're Still an A%*hole For Voting For Nader and Godspeed, President Meal Ticket, get both of them signed, and save on shipping! 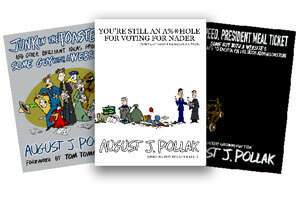 Buy both You're Still an A%*hole For Voting For Nader and Junk in the Toaster, get both of them signed, and save on shipping! 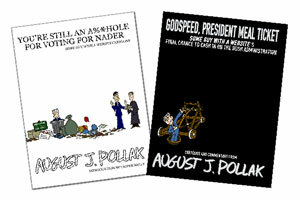 Buy both Godspeed, President Meal Ticket and Junk in the Toaster, get both of them signed, and save on shipping! You're Still an A%*hole For Voting For Nader, Godspeed, President Meal Ticket, and Junk in the Toaster. Get all three signed, and save on shipping! 21 cartoonists who are moving from the world of print into the Internet to produce some of the funniest, outrageous and innovative comics around. Each cartoonists presents a collection of their work as well as a one-on-one interview with editor Ted Rall. Artists featured include: August J. Pollak, Matt Bors (Idiot Box,) Nicholas Gurewich (The Perry Bible Fellowship), Brian McFadden (Big Fat Whale), Mark Fiore (2010 Pulitzer Prize winner) and Richard Stevens (Diesel Sweeties). 128 pages. I have exactly one copy of this book left! I do not forsee any chance of getting more copies, or the book being reprinted. Pins are mailed via the high-tech practice of wrapping it in a paper towel and putting it in an envelope with a first-class stamp. 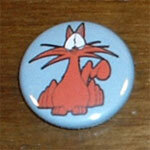 1" pin bearing the ever-confused image of Right-Wing Conspiracy, your favorite kitty and mascot for Some Guy With a Website. Signed prints are available for any strip found on the website. They are printed on 8.5x11" photo-quality paper direct from the original master digital files. Please note that prints will be in the format as they appear online: in other words, color prints are only available for strips that appear in color on the site. All prints are hand-signed; if you want them personalized indicate as such in the area to the right. The cost of a signed print is $20, which includes shipping. Please allow 5-10 business days for preparing and shipping. Note: the form to the right is for the regular single-page cartoons only. Please contact me before purchase about the price for prints of multi-page strips (ex. Christmas strips) or other illustrations. For inquiries about purchasing original artwork or custom original drawings, please contact me directly at . All my originals were drawn with archival-quality ink on acid-free paper, and should I ever snap and go completely insane, such a piece in your collection will only skyrocket in value. All original cartoons are in black ink; lettering and coloring is done digitially. In addition, some cartoons may have been partially assembled digitally.I will send a picture of any original to the potential buyer before purchase for their review. At the buyer's request, I will offer to add the lettering to the artwork by attaching word balloons printed on acid-free paper to the original to give the cartoon a finished appearance, perfect for framing and display. I will also include a signed print of the final cartoon as it appears on the website. I sell originals for as low as $75. Please contact me regarding a specific cartoon or cartoons for more details. Please note as well that the sale of original artwork does not provide the purchaser with any copyright to the work itself, or any derivations thereof. Original art is sold for personal enjoyment only and may not be used for any commercial or other public means without express consent of the artist. Thanks for giving me your money! 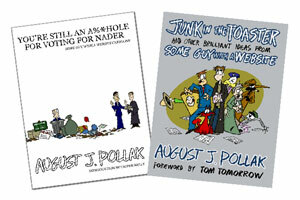 All content on this site except when specifically noted © 1999-2012 August J. Pollak. The views of this site are solely of the author and do not necessarily reflect those of the author's employers or affiliates. All content on this site is controlled solely by the author and is produced independent of any employer, organization, or entity unless otherwise noted.